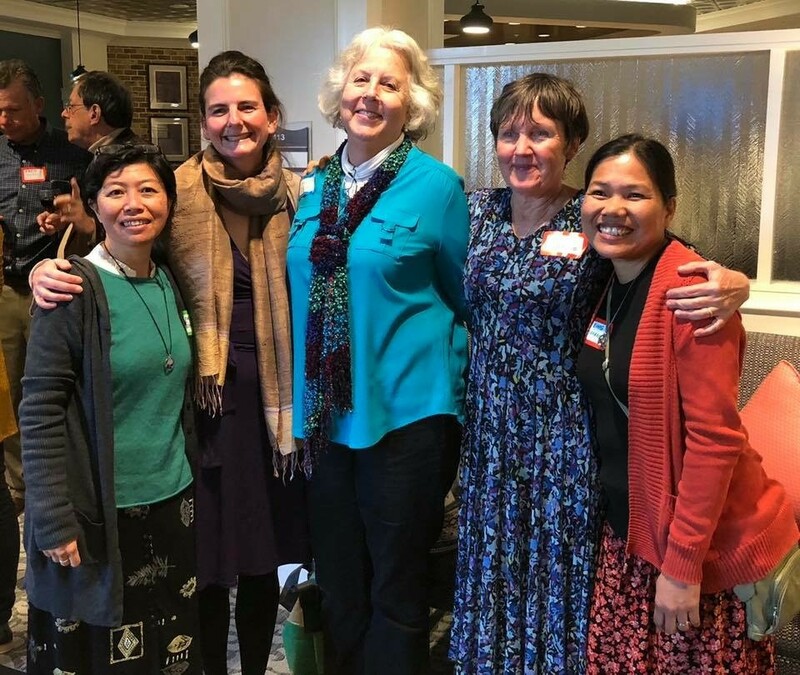 Sally from Rahamim has recently returned from an international gathering which brought together many like groups founded on the work of Thomas Berry in Greensboro, North Carolina, USA. Around 150 invited guests from around the world gathered in Greensboro for the occasion of Margaret Berry’s 100th Birthday and the annual Thomas Berry Award investiture. Greensboro was the home town of Thomas and his 12 siblings, Margaret being one of the two surviving. Margaret is known to Thomas’s students as a major contributor to his life and work, having been his personal secretary and archivist of his extensive writings and responsible for them being added to the catalogues of Harvard University. A respected professor emeritus in her own right, Margaret’s contributions were honoured during many celebrations over the course of the weekend, organised by members of the Berry family and the Thomas Berry Foundation. Meeting Margaret was a huge honour and she was delighted to hear about the legacy of Thomas’s work extending throughout Australia via Rahamim. There were also opportunities to visit sites of interest connected to Thomas Berry, including his family home, the places in which he wrote, where he died, the famous “meadow” which inspired a lot of his thought and other places featured in his writings. Apart from numerous family members present, the guests included global leaders in the field of Religion and Ecology including Mary Evelyn Tucker (editor of most of Berry’s books and co-founder and co-director of the Forum on Religion and Ecology at Yale University, teacher of the joint Master’s program in religion and ecology at Yale between the School of Forestry and Environmental Studies, and the Divinity School). John Grim (also from Yale), Herman Greene (founder of the Centre for Ecozoic Studies), Gail Worcelo and Bernadette Bostwick (Co-founders with Thomas Berry of Green Mountain Monastery and the Thomas Berry Sanctuary) and many other founders of similar centres inspired by Berry’s work. As a result of the many engagements over the course of the weekend, guests had many chances to interact. It resulted in more invitations to visit other centres not on the timetable, one of which happened to be in Greensboro and incorporated a 2km universe story walk with original script, through a deciduous forest. It was an enormous privilege to be present for the investiture of the Thomas Berry Award at the Greensboro Public Library. The award was presented to Pricey Harrison. Harrison has served Greensboro and Guilford County as a member of North Carolina House District 57 since 2004. She has been a passionate environmental supporter, working to build and maintain a green economy in North Carolina. Her efforts in supporting green and sustainable jobs have helped create 10,000 new jobs across the state. She was largely responsible for the 2007 legislation that made North Carolina one of the few states with REPS provisions, the Renewable Energy and Energy Efficiency Portfolio Standard. This requires that public utilities generate a significant and increasing amount of retail customers’ energy needs via renewable resources (such as solar, wind, hydropower, geothermal, and biomass). Pricey Harrison continues to advocate for the natural environment, and writes weekly newsletters to maintain her constituents’ knowledge about legislation and legal issues.